August 13, 2010 — Look west at 9 p.m. for the moon and a planetary grouping. A summer grouping of bright planets is visible in the western sky during the early evening hours of August 2010. 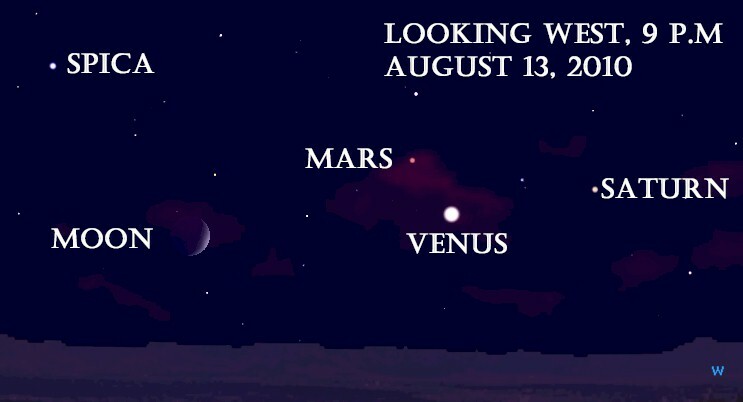 Venus, Mars and Saturn have sparkled in the evening sky all summer, although separated in the sky. In early August, they begin to cluster in the western sky. On the evening of August 13, the moon joins the trio to form a spectacular grouping as shown in the diagram above. Look west at 9 p.m. CDT, in the Chicago area, or about 40 minutes after sunset for other areas. Locate a place that has a largely unobstructed view of the western horizon. The waxing crescent moon can be seen south of west near the horizon. Look carefully, you may notice the night portions of the moon are lit dimly. This is known as Earthshine. The same effect occurs on Earth at the time of the full moon. Sunlight reflects from the moon and lights up the ground on Earth. Brilliant Venus is to the right (north) of the moon. It’s brightness makes it easy to find. Only two other objects in the sky are brighter than Venus — Sun and Moon. While these objects are close in the sky, Venus is about 75 million miles away. Reddish Mars is dimmer than Venus and appears to the upper left of Venus. On this evening, Mars is approximately 190 million miles from Earth. Yellowish Saturn appears to the upper right of Mars and slightly dimmer. Of the solar system objects in this grouping, Saturn is most distant at 930 million miles away. The bluish star Spica appears high above the moon, shining from 260 light years away. Mars and Saturn will again group together in mid-August 2012 in the western evening sky. In December 2015, the three planets will again appear close together, although they will be widely spaced in the morning sky. Jupiter will also appear with the wide grouping. These planetary groupings are not everyday occurrences, are worth noting, and interesting observing. Keep looking up! We Need Educational Leaders Who Can Move Us to the Next Level — Forward is Not Far Enough! The district technology leader could be an administrator, manager, or teacher who has responsibility for technology operations across a school district.